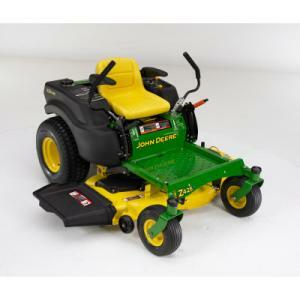 The John Deere EZ Trak Residential Zero-Turn Mower is an excellent residential riding lawn mower. The zero-turn capability makes it simple to mow even the smallest or most intricately landscaped yards, and it cuts with excellence and precision. The machine itself is easily serviceable and rarely breaks down anyway – it is quite reliable. I have had a great time so far using my EZ Trak Residential Zero-Turn Mower. It’s quiet enough to not bother the neighbors but strong enough to cut grass even when it’s been let to grow for two or three weeks. However, there are a few slight problems with my Ez Trak Residential Zero-Turn Mower. First, I wish I had found an attachment that would allow me to bag the clippings instead of simply mulching them. For those who regularly cut their lawns, this might not be a problem – the mower does an excellent job of mulching. But for those who let their yards go two or even three weeks before cutting, the clippings can suffocate and kill the grass if they are not picked up. The only other problem that I’ve experienced with my EZ Trak Residential Zero-Turn Mower is that the mower travels at an almost-painfully slow speed. I live on an acre lot with almost a half-acre of St. Augustine sod, and at the speed this mower travels it takes me an easy hour-and-a-half to cut the grass. Add to that the time it takes to weed-eat and edge the yard, and then clean up the clippings, and you’re looking at taking a lot longer to get your yard completely cut from using this riding mower. The payoff? You can be lazy and ride your lawnmower instead of having to heave it around the lawn. I wanted to comment about the speed of this mower. I have a home on 30 acres. I use the EZ trak to mow about 4 acres. This can be done in 2 hours. If the mower was moving any faster it would not be able to cut the grass evenly. This is a great mower for the price.